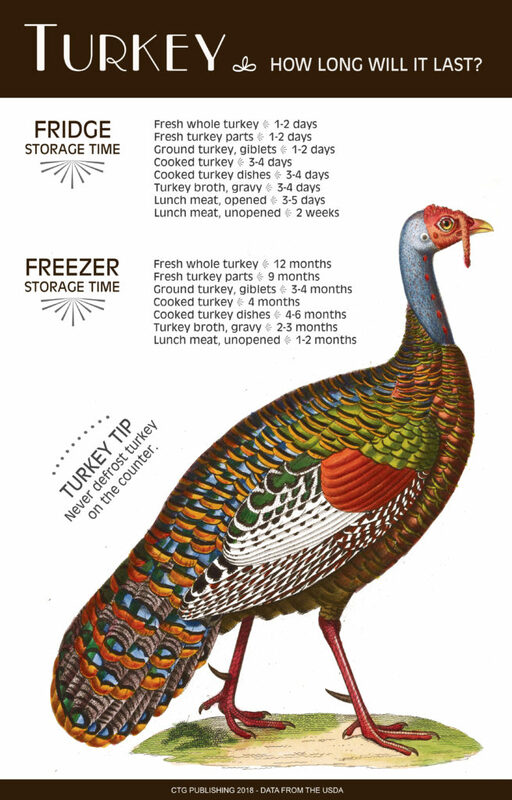 Turkey Storage Time – How Long Will It Last? View the table at How Long Can You Refrigerate Vegetables? View the table at How Long Can You Refrigerate Dairy, Fruit and Grain Products? How Long Can You Freeze Meat, Fish and Eggs? How Long Can You Freeze Dairy, Fruits, Vegetables and Grains? How Long Do Things Keep? View the below articles to see how long your favorite culinary items keep either frozen or fresh! Plan your shopping trip – maximize your culinary enjoyment. How Long Can You Refrigerate Meat, Fish and Eggs? How Long Can You Refrigerate Vegetables? How Long Can You Refrigerate Dairy, Fruit and Grain Products?